Q. What type of person should take the NS TOEFL Online Course? The New Standard TOEFL Online Course was made specifically with Master’s Degree candidates in mind. The NS Education TOEFL course targets a TOEFL test score of 100 points; most clients target 100-110 points. Q. How long should I take to finish the course? The New Standard Education TOEFL Online Course is a short intensive course to maximize scores in a limited period of time. The core course is 6 weeks (taking 3 video lecture classes/ week). Upon completing course content, candidates should spend 6 weeks working as many practice problems as possible. This means you should look to finish the course and your subsequent self-study working practice problems in about 3 months. Q. I am ready to get started with my TOEFL studies. What should I do now? Your first step is to go to the ETS (the test maker) website (http://toeflpractice.ets.org/) and purchase a full-length graded test. Don’t be cheap and skip this step, it is extremely important! You can get your full score (including for the spoken responses and essays which are graded by a computer) usually within a day. Clients should reserve enough time to take the full test straight through. For the speaking and writing sections, try your best; but make sure you write and say something or you will not be scored for these sections (which means you get a 0 score)! The results of this mock test will give you a realistic assessment and reveal weaknesses. Scores of 60 or below (~15 points per section) probably means you require more basic English training. Scores around 80 mean should plan to spend 1-3 months of intensive study to raise your score to around 100 points. Raising scores from 90s to 100+ require an additional 1-3 months. Once you have your score, send the score report to me at dgamble@on-mba-education.com, fill out and sign the course contract, make your payment, and then you will be ready to begin the course! Q. What does the basic New Standard TOEFL Online Course include? 8 full practice TOEFL tests plus additional in-class examples from ETS Official TOEFL Study Guides! Q. How does the feedback for my essays and spoken responses work? The basic New Standard TOEFL Online Course includes weekly written feedback on 22 essays and 54 spoken responses; see the chart below for a detailed list of the essays and spoken responses that will be provided feedback on as part of the course. Q. How do I send you my essays and spoken responses for feedback? Clients should send through their essays (as Word documents) and spoken responses (as mp3 format audio files) by email to dgamble@on-mba-education.com as they complete them. Q. How quickly will I receive feedback on my essays and spoken responses? Within 3 days (see above). Q. How do I practice more? Clients should continue to practice their essay writing and spoken responses as much as possible before test day by continuing to work through additional TPO (Toefl Online Practice Tests) questions. For each additional feedback package (2 available) clients will receive weekly written feedback on 22 additional essays and 60 additional spoken responses. Q. Do you offer refunds if I do not finish the lectures in 6 months or do not finish all my essays and spoken responses in 3 months? New Standard does not offer refunds; clients must stick to their study schedule. Q. How is New Standard TOEFL Online Course administered? The course provides six months’ access to 18 video lectures covering 40 hours of instruction class time. Clients log on, choose the lecture and start the video, which can be paused, fast forward or rewound. Clients receive a daily 6-week study planner for daily tasks. Q. Can I share my video lecture access with a friend? Each client receives a unique login and password. Sharing access to the videos with other clients is strictly prohibited. Q. When I do not understand something video lectures, can I directly contact you and ask questions? If something is not clear in the lectures, ask me at dgamble@on-mba-education.com. Q. I am worried that my English level is not high enough to understand the content of the lectures. The New Standard TOEFL Course is designed for clients with an intermediate to advanced level of English. Ideally when clients take their initial mock TOEFL test before starting the New Standard TOEFL course, they should score an 80, or very close to an 80 in order to obtain the maximum benefit from the course. Studying may be challenging at first, but keep in mind you will not only improve your TOEFL score during this course, but also your overall level of English. During your master’s degree program, you will be studying entirely in English, and the sooner you start studying in English, the more well-prepared you will be when you start your program! Q. Does the course provide any techniques or time management strategies for TOEFL to improve my score? The New Standard TOEFL Course includes detailed instructions and test strategies for each of the four sections of the test (Listening, Speaking, Writing and Reading) in the video lectures. The lectures present test taking strategies techniques on how to approach each test question confidently and efficiently and will help improve your time management during the test as a result. Can I extend access period of video lecture? Please let me know how many months I can extend and its cost. If the clients follow the daily study schedule included with the course, which has 3 classes per week scheduled, they will finish the lectures in 6 weeks (1.5 months). The course is designed to be completed in 3 months'time, with the remaining 1.5 months used to work practice problems. The New Standard TOEFL Course includes 6 months’ access to the video lectures. It is very rare that someone would need to extend video access time limit. If clients would like to extend the video access time limit, they can extend the video access time by 3 months for an additional non-refundable payment of JPY50,000. Q. Which version of Windows or Apples version require to access your online lectures? Bandwidth: 512Kbps for participants, meeting attendees, and end users of Adobe Connect applications. Connection: DSL/cable (wired connection recommended) for Adobe Connect presenters, administrators, trainers, and event and meeting hosts. Adobe Connect software includes support for the following languages: Brazilian Portuguese, Chinese Simplified, Dutch, English, French, German, Italian, Japanese, Korean, Russian, Spanish, and Turkish. Q. Regarding, 20-hour and 40-hour Intensive Speaking/Listening Package, do you use same textbook of 18-class online course or customized after talking to clients? All 20-hour or 40-hour customized Intensive 1-on-1 live Speaking / Listening Packages include the same Speaking and Listening Section strategies that are presented in full NS TOEFL course. If the client has already taken the NS Online TOEFL, we will quickly review these strategies and refer to the note-taking and speaking templates that were presented in the course as we work through practice problems together. If the client has already taken the NS Online TOEFL course, we will work through practice questions that I provide from past TOEFL Practice Online Tests (TPOs). If the client has NOT already taken the NS TOEFL course, NS will present the Listening and Speaking section strategies and speaking templates that are taught during the course for these sections first and then we will work through practice problems together. If the client has NOT already taken the NS TOEFL course, we will first work through the practice questions in the same Original Study Guide books that are used in the course, and move onto the TPOs as necessary. Q. 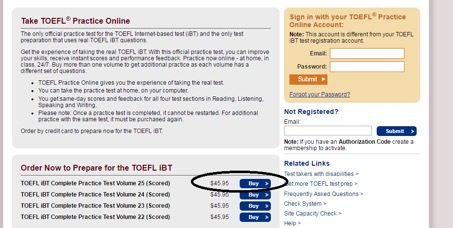 How can I pay for the On-MBA Education Online TOEFL Course? Payments can be made by PayPal or by bank transfer; please indicate your preferred payment method in the service contract and the transfer details will be provided to you for payment. Setting up a PayPal is remarkably easy and you can set up an account at the official Japan PayPal website here https://www.paypal.com/jp/home in just a few minutes. Payments can be made by major credit cards (Visa or MasterCard) via the clients PayPal account. Please note that the client must have his or her PayPal account set up and linked to the credit card he or she would like to pay with before using this payment method. I was accepted by Claremont, Vanderbilt, Babson, and UC Irvine. I already decided to enroll UC Irvine. I really appreciate that your training was so efficient and helpful.